If you want to see him and Jonathan Rhys Meyers blow up Paris good, go nuts. But I think you'd be better off rewatching any of the Bourne identities. For a great stab at what's wrong with From Paris With Love, check out this review by Roger Ebert. 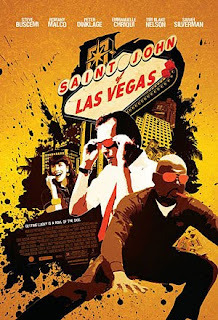 And for a movie that's actually worth watching, try Saint John of Las Vegas. It's a rare treat for Steve Buscemi fans giving him ample space to do his trademark slow burn. Saint John of Las Vegas is a road movie of sorts. Steve plays John, a reformed gambler turned insurance investigator on the case of a suspicous car crash. With his no-nonense partner Virgil, they set off to visit the scene of the crime and interogate witnesses. Along the way you'll meet Tim Blake Nelson, Sarah Silverman and John Cho. What I liked about this film is that it didn't try to oversell the comedy. This isn't going for a in-your-face laugh attack like the overhyped The Hangover. Saint John is a gentler, more grounded brand of funny. John is just a guy, trying to do a job and get back in one piece. And who better to play the sad-sack hero than Buscemi, a man whose face was built for pain. Like watching Charlie Brown trying to kick the football, you can help but root for him. As a opposed to John Travolta's over-sized Mini Me character, John fits Steve Buscemi as well as the simple suits he wears. You might say he's typecast from his Mr.Pink days of Resivor Dogs. But I think he's just playing to his stregth.